In the spirit of personalizing and adding some visual interest to tote bags and towels and potholders and god knows what else, I figured I’d learn how to embroider. Working with floss is surely a bit easier than standard needle and thread, and I need to learn these things. Last night, I picked a scrap of one of the Goodwill sheets with a lot of lines and patterns to follow and set to work. The book… which is in the other room and to which I will link later… clearly demonstrates “12 easy stitches” and has not only photographs and diagrams, but very easy-to-follow written instructions: “Needle up at 1, make a loop counter-clockwise, needle down at 2,” and so forth. 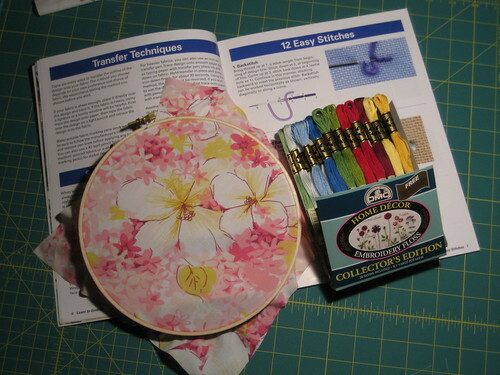 It’s something I can do away from the sewing machine, in bed to wind down, et cetera. Yay.